I had the great privilege of meeting Monica Migliorino Miller at Notre Dame when the current resident of the White House was given an honorary degree in 2009. 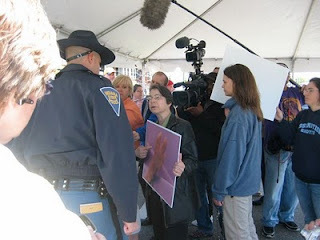 Her passion for babies in the womb is inspiring and was a sight to behold as she broke through police lines,in order to show the ND graduates families the horror the speaker they were about to hear advocates. This month her organization put their passion into practice by helping to see that tiny baby bodies, found in the trash in Michigan, were given a proper burial. Monica Miglioriono Miller states: "The abortion clinic treated these human beings as if they were trash. Pro-lifers buried them--and treated them with dignity and respect. In this we see the clash of two cultures--and it matters which one shall prevail. This grave is a place of justice and healing--healing for all the mothers and fathers who grieve the loss of their aborted child. But this grave is also an indictment--an indictment against a nation that allows this sort of atrocity. 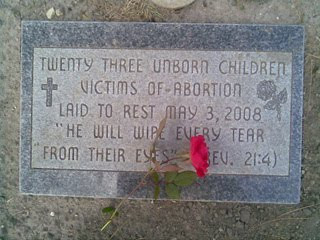 The voices of these unborn children cry out to us from the ground that covers them now. Let us hear their plea and end the injustice of abortion." Monica's heroics have, unbelievably, made the New York Times in this remarkable piece. Thank God for the remnant in our society who still hold that every human life is sacred with infinite worth in God's sight! Please make sure these graves and their markers make it onto Find A Grave. This would give grieving parents in general -- and these particular children's parents, when they come to their senses -- an online site to visit.